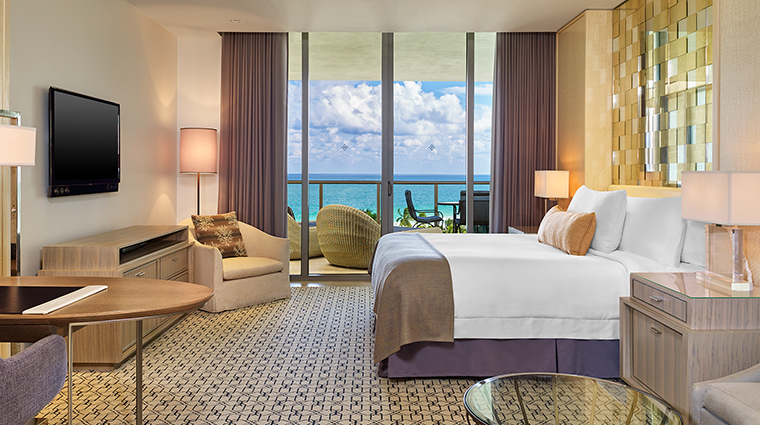 The St. Regis Bal Harbour Resort offers some of the most luxurious accommodations in northern Miami, furnished in a contemporary residential style with spacious terraces and oversized lounge chairs. 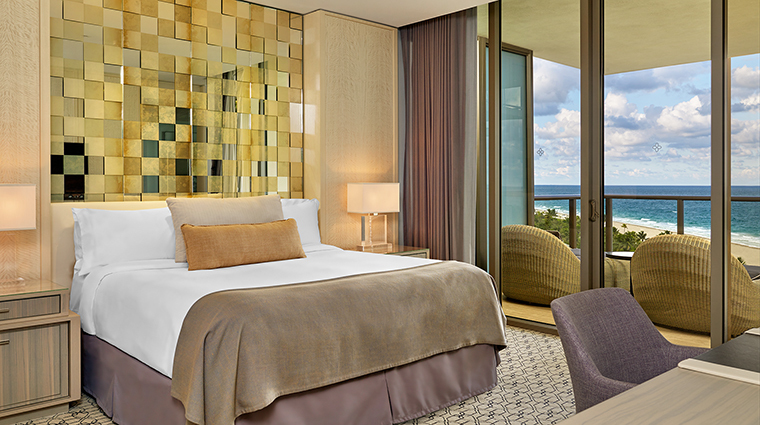 All rooms allow you to enjoy great ocean views, thanks to the hotel’s zigzag configuration. Of course, the white sandy beach directly in front of the hotel is a main draw, though the pools (which include one for kids and one for adults only) also offer luxe seating along with thoughtful extras such as complimentary fruit, cucumber water and sun care products. Yet what really stands out about the Miami hotel is the high level of personalized and considerate service. Whether it’s getting a plate of macarons and a handwritten note with turndown service or having a long and thoughtful conversation with the excellent concierges about where in the city to find the best stone crabs, you can rest assured that the staff here really excels in making your stay as enjoyable as possible. 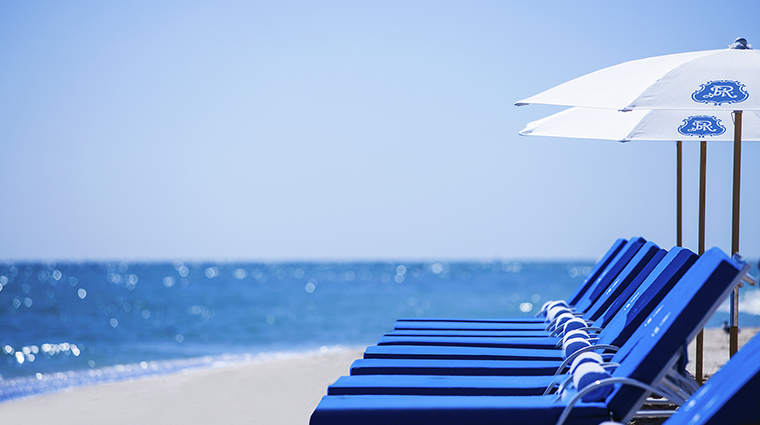 Comfy chairs and umbrellas (plus a full staff to help assist you in any way) are set up for you on the stretch of white sandy beach in front of the Miami hotel overlooking turquoise waters for a little fun in the sun. Whether it’s leaving you a handwritten note wishing you a pleasant stay with your turndown service or staff offering you a welcome glass of champagne, know that the staff truly cares. 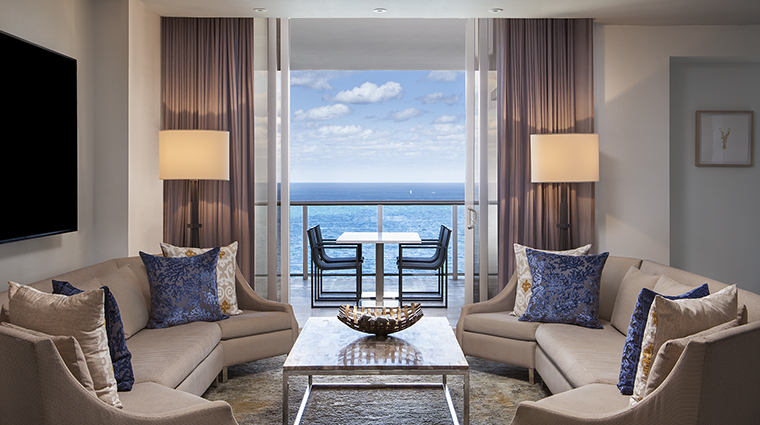 Every room here boasts a spacious balcony with oversized lounge chairs that are the perfect spot for admiring the ocean vistas. 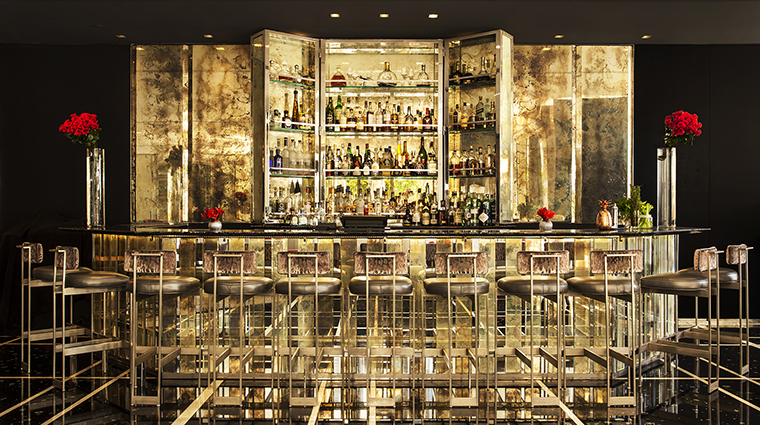 We love The St. Regis Bar and Lounge, not only for its great cocktail and champagne collection, but because it offers a comfortable and luxurious setting and great nibbles. 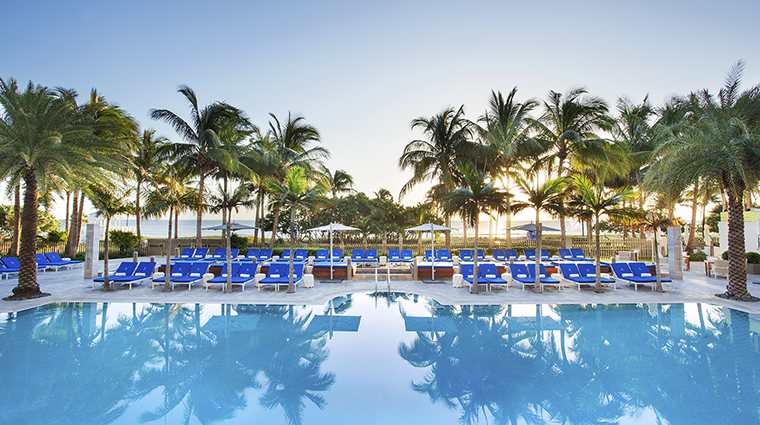 With a kids’ club offering daily activities like water relays and musical dive rings, plus a kids’ room service menu that even includes complimentary baby food purées, the Bal Harbour hotel knows how to create a memorable experience for even the littlest traveler. Every night at 7:30 p.m. in the bar, you can witness the St. Regis tradition of a champagne bottle being opened with a saber — and you’ll get to drink the bubbly after it’s been opened. Bal Harbour is a little far from central Miami. In terms of restaurants and cultural activities, you’re somewhat limited in the immediate surrounding area. The beach and pool are both excellent, and it’s easy to spend your entire vacation without ever leaving the grounds. Rooms at the 24-story hotel are elegant and contemporary in look, fashioned in a neutral color palette with Art Deco detailing. Upon entering a standard Ocean View room, you’ll be greeted by a pale purple foyer decorated with koi fish wallpaper. A long hallway then leads into the bedroom, which is decorated in a sophisticated color palette of cream, white and gold with pale blue accents. The bed faces a flat-screen Samsung television with Blu-Ray player; there’s also an Inncom touch-screen control console on one of the two nightstands that acts as a control center for the room. The marble-clad bath has a separate water closet, spacious vanity, soaking tub and walk-in shower. 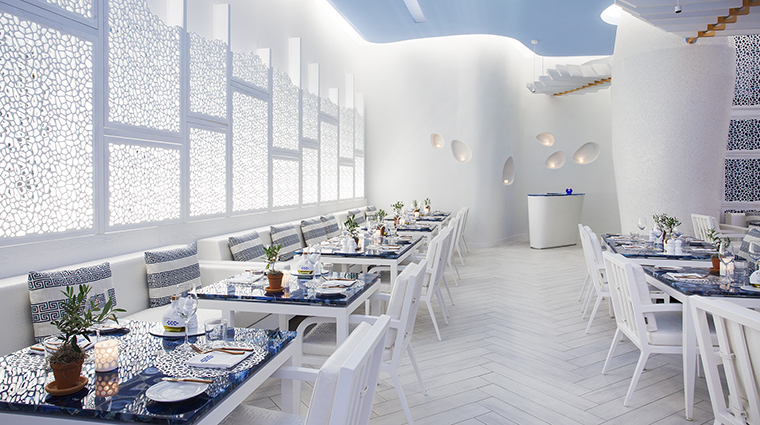 Chef Anastasios “Tasos” Chasekioglou offers a curated selection of traditional Greek dishes tailored to Miami at Atlantikos. 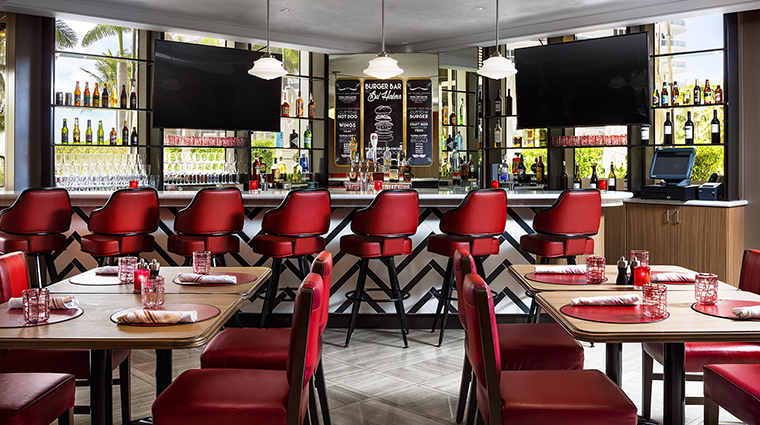 BH Burger Bar offers a customizable menu featuring build-your-own burgers, gourmet franks, wings, signature sides and indulgent shakes paired with local craft beer, all in a lively and relaxed space. Enjoy casual, yet elevated fare like truffle Parmesan tater tots, the wagyu beef dog and the salted caramel milkshake at BH Burger Bar. La Gourmandise offers the largest tea selection in Miami, showcasing 30 blends and unique flavors created exclusively for The St. Regis Bal Harbour. Enjoy a sophisticated menu of French favorites for breakfast, lunch and afternoon tea.